It is truly rewarding for me to know I offer the solution to the problem of giving yourself wrinkles while you sleep. 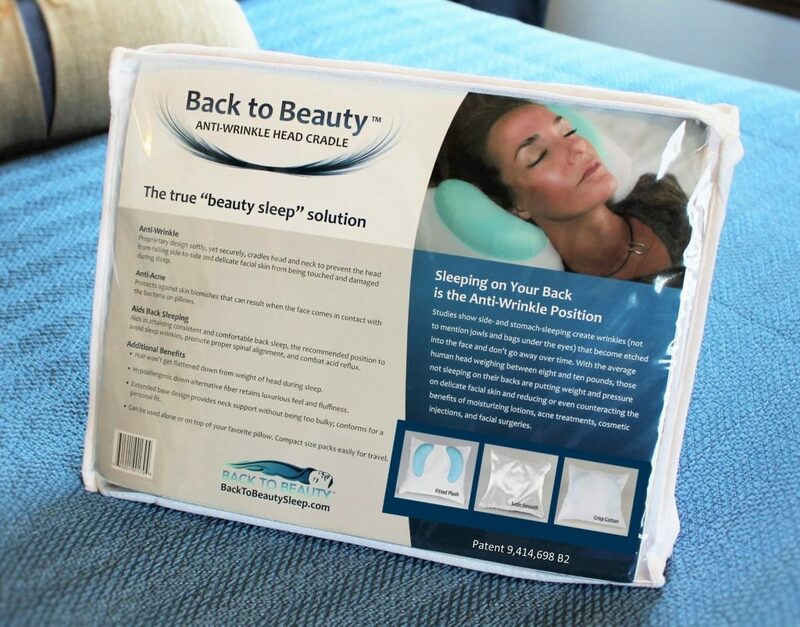 The solution being the Back to Beauty Anti-Wrinkle Head Cradle beauty sleep pillow. I am always on the hunt for articles I can share to promote awareness about the importance of back sleeping for wrinkle prevention. The below article by writer Carina Wolff is spot on and very thorough. So much so that I even learned a few more great reasons to sleep on your back! When you get into bed, you’re probably not giving your sleeping position much thought. Although it might not seem like it would make much of a difference, your sleeping position can have an impact on your health—and it turns out, the best way to sleep is on your back. If you currently don’t sleep on your back, you’re not alone. Only eight percent of people sleep on their back, despite the number of physical benefits the position offers. Luckily, there’s time to change that. We spoke with three dermatologists to discover six reasons why sleeping on your back is ideal for your health and beauty. Sleeping on your back can help with neck and back issues, says dermatologist Dr. Ava Shamban, since your body is straight and your weight is more evenly distributed across your frame. This can help take the stress off your lower back, especially if you utilize extra pillows. “You can achieve this position by putting pillows under your knees and calves as well as your head,” says Dr. Shamban. Sleeping on your back can help alleviate muscular tension in your neck, shoulders and other nearby muscles. This cannot only help with any muscular pain, but it can help you sleep better as well. Relaxing your muscles by relieving tension can improve your quality of sleep and even help with insomnia. Sleeping on the side of your face can cause wrinkles, also known as “sleep lines.” “These lines often appear in parallel along the temples, around the eyes, the lateral cheek area and around the mouth,” says dermatologist Kachiu Lee, MD. “People who have been sleeping on the same side for years often have noticeably more ‘sleep lines’ on the side that they sleep on.” Sleeping on your back prevents your face from rubbing up against the pillow, which can help keep your skin looking smooth. It also can help prevent facial asymmetry, as years of sleeping on one side of your face can promote unevenness in the texture or volume of your face. Dr. Shamban adds that back sleeping helps your entire body relax, which “reduces inflammation allowing better results for cell turnover in the face,” which is your skin’s way of getting rid of dead skin cells to make room for new cells to grow. In addition to fewer wrinkles on your face, sleeping on your back can help you have fewer wrinkles on your neck as well. Applying pressure to the same area of skin breaks down collagen, which leads to those unwanted lines. “Since you’re not scrunching your head down into your chest, your neck is extended, which helps it be less wrinkly,” says Shamban. If you’ve splurged on an expensive night cream, you’re not going to want half of it to come off your face onto your pillowcase. Sleeping on your back can help you avoid this as well as eliminate any potential breakouts caused by your pillowcase. “In addition to transferring your night creams to the pillowcase,” says Lee, “the pillowcase is also transferring a host of bacteria and other debris to your face.” She continues, “If you keep getting unexplained acne eruptions on the side of your face, your dirty pillowcase may be the cause.” It’s also best to let your face cream sit for at least 20 minutes before going to bed so that it has time to absorb.